Karen Page and Andrew Dornenburg are regularly invited to travel around the world to address subjects in their areas of expertise, which include chefs, cooking, creativity, customer service, flavor compatibility, food and drink pairing, healthful eating, hospitality, plant-strong cuisine, restaurants, vegetarianism, wine, and many other subjects (e.g., “The Art of Good Taste”). To schedule an interview, contact Little, Brown publicist Zea Moscone at zea.moscone@hbgusa.com or 212.364.1464. To invite them to speak, teach, and/or consult, contact them at calendar@karenandandrew.com. Karen Page attends Northwestern University’s Council of 100’s Fall 2018 meeting in Chicago. Karen Page WCAS ’83 joins the “Class of 1983” at their 35th Reunion on campus at Northwestern University. 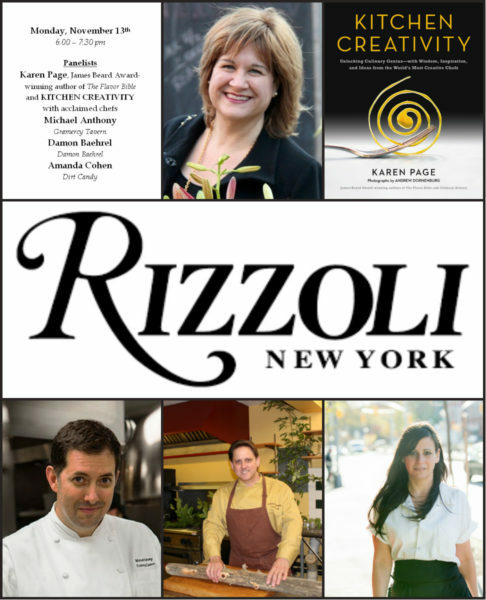 Karen Page is featured as a celebrity sous chef at this inspiring annual event featuring dozens of New York City’s leading women chefs. Karen Page and Andrew Dornenburg will sign copies of their latest book KITCHEN CREATIVITY along with THE FLAVOR BIBLE on Saturday, May 12th, from noon – 2 pm at Fante’s Kitchen Shop in Philadelphia. Karen Page and Andrew Dornenburg attend the 2018 James Beard Foundation Awards at the Lyric Opera House in Chicago. Karen Page NU ’83 is a guest speaker on KITCHEN CREATIVITY at “A Day With Northwestern,” which attracts more than 400 alumni, students, parents, and friends for a full-day series of presentations and lectures on the University’s Evanston campus. For more than 40 years, this annual event has featured prominent Northwestern faculty and alumni speakers on a variety of timely topics. Karen Page attends the Spring 2018 meeting of The Council of 100, an organization of the University’s 100 leading professional alumnae (of which she was named a founding member in 1993). Karen Page and Andrew Dornenburg are invited to speak about KITCHEN CREATIVITY at the 10th Annual Tucson Festival of Books, which they’d kicked off a decade ago. Karen Page and Andrew Dornenburg will sign copies of KITCHEN CREATIVITY at the International Restaurant & Foodservice Show at the Jacob Javits Center in New York City. Details TK. The annual International Association of Culinary Professionals (IACP) conference comes to New York City. Karen Page and Andrew Dornenburg will sign copies of KITCHEN CREATIVITY and THE FLAVOR BIBLE at Fante’s Kitchen Store in Philadelphia’s Italian Market from noon – 2 pm. Author Event Karen Page & Andrew Dorenburg: Kitchen Creativity Fran Costigan: Vegan Chocolate February 10 12 – 2pm We’ll have Karen Page & Andrew Dorenburg here to sign copies of their new book, Kitchen Creativity. The authors of The Flavor Bible are back with this groundbreaking exploration of culinary genius. Karen Page and Andrew Dornenburg will be hosted for a media-only lunch at Melissa’s in Los Angeles. Karen Page and Andrew Dornenburg will discuss and sign copies of KITCHEN CREATIVITY at Vroman’s bookstore (695 E. Colorado Blvd.) in Pasadena at 7 pm on Wednesday, January 24th. Karen Page and Andrew Dornenburg will discuss and sign copies of KITCHEN CREATIVITY at Now Serving (Far East Plaza, 727 N. Broadway #133) in Los Angeles at 7 pm on Tuesday, January 23rd. Host Derek Timm interviews Karen Page and Andrew Dornenburg about KITCHEN CREATIVITY. Karen Page is interviewed by host Dara Moskowitz Grumdahl about KITCHEN CREATIVITY on Minnesota Public Radio. Karen Page is interviewed about KITCHEN CREATIVITY on KKOB-AM Radio. Karen Page is interviewed about KITCHEN CREATIVITY on the podcast Cookery by the Book. Karen Page is interviewed about KITCHEN CREATIVITY on the show “Flavors” on KSCO Radio. Karen Page is interviewed by Gary Duff, host of “New American Kitchen” on WOR Radio. Karen Page is interviewed about KITCHEN CREATIVITY by Amanda Magnus on Wisconsin Public Radio. 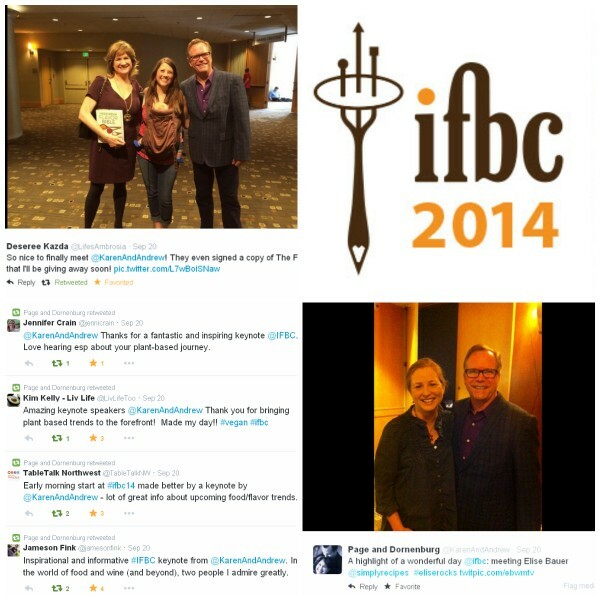 Karen Page is interviewed about KITCHEN CREATIVITY by host Lori Ness on Seattle Radio Waves. Karen Page is interviewed about KITCHEN CREATIVITY on KTRS-AM Radio. “On the Menu” co-hosts Ann & Peter Haigh interview Karen Page and Andrew Dornenburg about KITCHEN CREATIVITY. Chef Jamie Gwen interviews Karen Page and Andrew Dornenburg about KITCHEN CREATIVITY. Karen Page attends Citymeals-on-Wheels’ annual Power Lunch for Women, which raises $1 million-plus to feed New York City’s homebound elderly. Karen Page is a two-time James Beard Award-winning author whose books include The Vegetarian Flavor Bible and The Flavor Bible, which was named one of the year’s best cookbooks on both Today and Good Morning America, one of the 100 best cookbooks of the last twenty-five years by Cooking Light, and one of the ten best cookbooks in the world of the past century by Forbes. The former Washington Post wine columnist is also the author of What to Drink with What You Eat, which was named the IACP Cookbook of the Year and Georges Duboeuf Wine Book of the Year; Culinary Artistry, which Food & Wine named one of the world’s best cookbooks; and Becoming a Chef, which the New York Times Business section described as “a chef’s guide for executives.” She lives with her husband, author and photographer Andrew Dornenburg, in New York City. Michael Anthony is Executive Chef and Partner of Gramercy Tavern, as well as Executive Chef and Managing Director of Untitled and Studio Cafe at the Whitney Museum of American Art. An alum of Daniel and March restaurants, Mike was formerly a chef at Blue Hill in Manhattan and Blue Hill at Stone Barns in Pocantico Hills, New York. He joined Gramercy Tavern as the Executive Chef in 2006. Under his leadership, the restaurant has earned a three-star New York Times review (2007) and James Beard Awards for “Outstanding Restaurant” (2008) and “Best Chef: New York City” (2012). In 2015, Mike won the James Beard Award for “Outstanding Chef,” a national recognition. His book, V is for Vegetables, won the 2015 James Beard Award for Best Vegetable-Focused Cookbook. Damon Baehrel works completely alone in his eponymous restaurant, located in the basement of his and his wife Elizabeth’s home in rural Earlton, NY, about 2 1/2 hours north of Manhattan on the 12-acre property/Native farm that is the only source of ingredients/components for his original self-derived Native Harvest Cuisine. The intimate restaurant has become a sought-after destination for food enthusiasts from around the world since its opening in 1989. In addition to being a chef and organic grower, Damon is a master forager as well as native plant and mushroom expert. He creates by hand every component required to execute the 5+ hour Native Harvest Experience including unique flours, pressed oils, tree sap brines and vinegars, cheeses, pineneedle-cured meats, and one-of-a-kind seasonings. The legendary, ever-changing Native Harvest Tasting menu is prepared and served to dining guests personally by Damon. The self-taught chef, who has been a semifinalist for the James Beard Award, recently authored, photographed, and published his first book, Native Harvest: The Inspirational Cuisine Of Damon Baehrel. Amanda Cohen is the chef and owner of Dirt Candy, the award-winning vegetable restaurant on New York City’s Lower East Side. Dirt Candy was the first vegetable-focused restaurant in the city and the leader of the vegetable-forward movement. The restaurant’s original location only had 18 seats and was open for six years, during which time it became the first vegetarian restaurant in 17 years to receive two stars from the New York Times, was recognized by the Michelin Guide five years in a row, and won awards from Gourmet magazine, the Village Voice, and many others. Its new location opened in January, 2015 and it was the first restaurant in the city to eliminate tipping and share profits with its employees. Amanda was the first vegetarian chef to compete on Iron Chef America and her comic book cookbook, Dirt Candy: A Cookbook, is the first graphic novel cookbook to be published in North America. It’s currently in its sixth printing. She is also a Canadian. KITCHEN CREATIVITY will be featured at a book event at the Culinary Institute of America at Greystone in St. Helena, California, on Wednesday, November 8th. Author Karen Page and photographer Andrew Dornenburg will be in conversation about KITCHEN CREATIVITY, and the James Beard Award winners will sign copies of KITCHEN CREATIVITY thereafter. 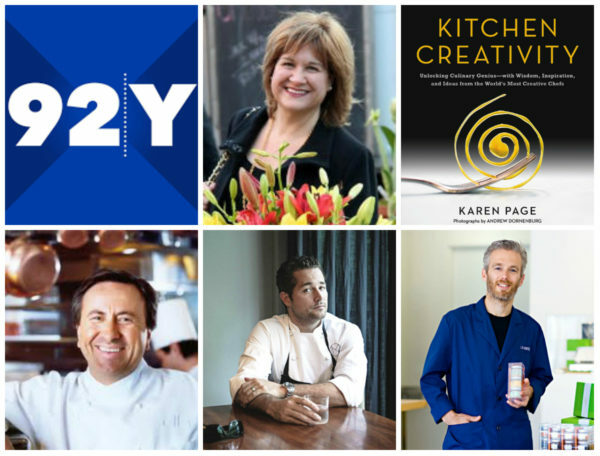 KITCHEN CREATIVITY will be featured at an in-house author event at Google on Tuesday, November 7th, at 11:30 am PT, with James Beard Award winners author Karen Page and photographer Andrew Dornenburg in conversation with Google executive chef Scott Giambastiani. KITCHEN CREATIVITY will be featured at a book event at Copperfield’s Books (140 Kentucky Street) in Petaluma on Sunday, November 5th. Author Karen Page and photographer Andrew Dornenburg will be in conversation with Clark Wolf from 3-4 pm, and the James Beard Award winners will sign copies of KITCHEN CREATIVITY from 4-4:30 pm. Karen Page and Andrew Dornenburg will be interviewed about KITCHEN CREATIVITY at Paradise Ridge Winery in northern California. Rotisserie Georgette will feature KITCHEN CREATIVITY author Karen Page in conversation with CORK DORK author Bianca Bosker on Saturday, November 4th, at noon over a three-course lunch with wine pairings ($69). For tickets or more information, click here. In a unique take on the classic literary salon, Georgette Farkas continues her Saturday “Author! Author!” lunch series at her restaurant, Rotisserie Georgette, on Manhattan’s Upper East Side. “We are privileged to have a coterie of renowned authors as regulars here at the Rotisserie, and now a select few have agreed to take part in intimate events where our guests can meet them over lunch to discuss their books and shared passions,” explains the restaurateur. This season’s author series of two Saturday afternoon events is entirely wine–themed. Each event includes a presentation by two authors discussing their books and the topic at hand. Guests enjoy lunch during the presentation and are then invited to take part in the Q&A and book signing. The three-course menu, paired with Champagne Piper Heidsieck, will include an array of autumn salads, the restaurant’s signature roast chicken or vegetarian farrotto as a main course, and profiteroles to finish. On Saturday October 28th, spend the afternoon with best-selling wine writer, Peter Hellman, a contributor to Wine Spectator, The Wall Street Journal, New York Post and The New York Times; and Mark Oldman, celebrated for his singular ability to unravel wine’s complexities with a potent blend of entertainment, style, and humor. Peter’s “In Vino Duplicitas – The Rise and Fall of a Wine Forger Extraordinaire” explores the Rudy Kurniawan scandal set in the privileged world of ultrafine wines, where billionaires flock to exclusive auction houses to vie for the scarce surviving bottles from truly legendary years. “How to Drink Like a Billionaire” by multiple-award-winning author Oldman, a Phi Beta Kappa alum of Stanford and Stanford Law School, unlocks the mysteries of how the 1 percent drink, so that you can drink and savor wine better – and cheaper. On Saturday November 4th, the wine-soaked discussion continues with award-winning authors Bianca Bosker and Karen Page. Bianca will tell the tale behind “Cork Dork: A Wine-Fueled Adventure Among the Obsessive Sommeliers, Big Bottle Hunters, and Rogue Scientists Who Taught Me to Live for Taste”. She is a former Huffington Post executive tech editor whose work has appeared in the Atlantic, The New York Times T Sstyle, Food & Wine, The Wall Street Journal. Karen Page is the two-time James Beard Award-winning author of “The Flavor Bible” whose newest work is “Kitchen Creativity: Unlocking Culinary Genius—with Wisdom, Inspiration, and Ideas from the World’s Most Creative Chefs.” Her “What to Drink with What You Eat” earned the IACP Cookbook of the Year Award and the Georges Duboeuf Wine Book of the Year Award, while “The Food Lover’s Guide to Wine” was named “Best in the World” in its category at the 2011 Gourmand World Cookbook Awards. KITCHEN CREATIVITY will be featured on “The Leonard Lopate Show” on WNYC Radio in New York City. For professional chefs and home cooks alike, Page moderates this distinguished panel of seasoned chefs who are featured in her new book (with photographs by Andrew Dornenburg) Kitchen Creativity: Unlocking Culinary Genius—with Wisdom, Inspiration, and Ideas from the World’s Most Creative Chefs. They’ll discuss how good cooking is not just the right recipe or ingredients: it’s drawing on inner senses we can all cultivate for greater skill and creativity in the kitchen. Learn the secrets of becoming a great chef — the kind who can walk into a kitchen and create a dish from scratch and know exactly how to make it taste delicious. Daniel Boulud is considered one of America’s leading culinary authorities and one of the most revered chefs in New York, his home since 1982. He is chef-owner of 13 restaurants around the world, and is best known for his eponymous, exquisitely refined DANIEL on Manhattan’s Upper East Side. Outside of New York, the chef’s cooking can be found in London, Singapore, Toronto, Montréal, Miami, Palm Beach, Washington DC, and Boston. Daniel is the author of nine cookbooks (including Letters to a Young Chef), the recipient of multiple James Beard Foundation awards including “Outstanding Chef” and “Outstanding Restaurateur,” as well as the Culinary Institute of America’s “Chef of the Year Award” (2011) and The World’s 50 Best Restaurants “Lifetime Achievement Award” (2015). Daniel was named a Chevalier de la Légion d’Honneur by the French government in 2006 in recognition of his contributions to the advancement of French culture. He is a generous supporter and Co-President of Citymeals-on-Wheels for more than two decades, and is Chairman of the Ment’or BKB foundation. Formerly Executive Chef of The NoMad (where under his leadership it was awarded a Michelin star each year and was ranked#62 on the World’s 50 Best Restaurants list) and Chef de Cuisine of Eleven Madison Park, James Kent is in the process of using his 20-plus years of restaurant experience to build his flagship restaurant that will be opening in the coming year in New York. James joined the team at Eleven Madison Park as a line cook in the spring of 2007 and was quickly promoted to sous chef. In 2011, James was chosen to represent the United States at the international finals of the Bocuse D’Or in Lyon, France. After a full year of training for this culinary competition, he placed tenth in the world. Upon returning to New York, James was named chef de cuisine of Eleven Madison Park and during his time there, the restaurant received numerous accolades including four stars from the New York Times, three Michelin stars, and a coveted spot on the list of the World’s 50 Best Restaurants. Lior Lev Sercarz is the chef, spice blender, and owner of La Boite in New York City. Lior and La Boite have been featured in publications including The New York Times, Vogue, InStyle, Every Day with Rachel Ray, Food & Wine, and the Saveur 100. After completing three years as a sargeant of the Israeli army, Lior traveled to South America where he expanded his passion for cooking and world cuisines, later enrolling in the acclaimed Institut Paul Bocuse in Lyon. In 2002, Lior brought his newfound understanding of spice blending with him from France to New York, where he had the honor of working with Chef Daniel Boulud as a sous chef and catering chef at his flagship restaurant DANIEL. He left DANIEL in 2006 to start La Boite, and in 2011 he opened La Boite Biscuits & Spices, an art gallery and spice shop in Hells Kitchen. His books include The Art of Blending and The Spice Companion. KITCHEN CREATIVITY is published by Little, Brown & Company. Karen Page, a founding member of Northwestern University’s Council of 100 (leading alumnae), attends the Fall 2017 C100 conference in Chicago. Karen Page will again be one of two dozen “celebrity sous chefs” featured at SHARE’s annual event “A Second Helping of Life,” taking place Monday, September 18, 2017, at Pier 60 at Chelsea Piers in New York City. Karen Page and Andrew Dornenburg are interviewed by Jessica Dibb on “Understanding the Enneagram Through Wine and Food” for the 2017 Enneagram Global Summit, which runs June 5-9. Their interview runs on Friday, June 9th, at 2 pm ET. Karen Page attends the Spring 2017 meeting of Northwestern University’s Council of 100, a mentoring organization of the university’s 100 leading alumnae. The 2017 James Beard Foundation Awards will be held on May 1, 2017 at the Lyric Opera House in Chicago. Karen Page will interview Divya’s Kitchen chef-restaurateur and cooking instructor Divya Alter about her new book What to Eat for How You Feel: The New Ayurvedic Kitchen at Rizzoli (1133 Broadway at 26th Street) in New York City at 6 pm. 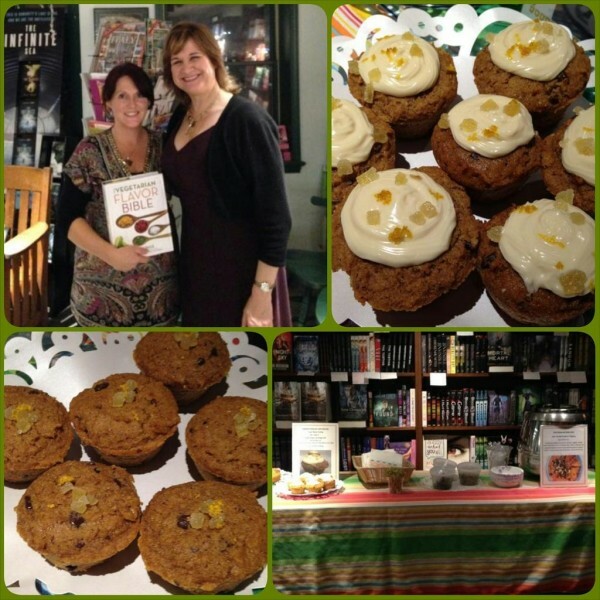 Complimentary tastes of recipes featured in the new book, and books for purchase and signing, will be available. The James Beard Foundation holds its “Sunday Supper” at Chelsea Market in New York City. 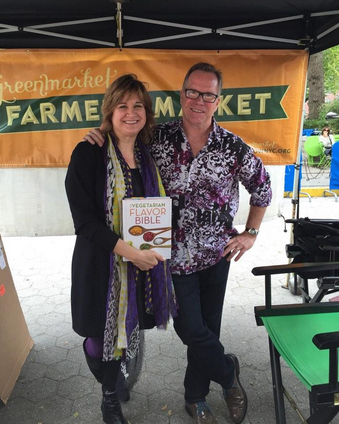 Karen Page and Andrew Dornenburg will be speaking at New York University on food writing. Citymeals Culinary Circle members Karen Page and Andrew Dornenburg attend the event “The Lifestyle of Food: Building a Food Brand” at Distilled in New York City. Join Citymeals for an evening of cocktails, canapés and collaborative discussion! A delicious “Meet, Greet, and Eat,” seven culinary favorites will come together for an intimate Q&A about their creative processes behind building a food brand, brand loyalty and what they see for 2017. Andrew gets another year wiser in 2016! Karen Page attends Citymeals’ 30th Annual Power Lunch for Women, which gathers more than 400 of New York’s most powerful women to raise $1 million+ to feed the city’s homebound elderly. Karen Page attends Northwestern University’s Council of 100 meeting. Karen Page and Andrew Dornenburg join the Wine Media Guild in welcoming British wine author Jancis Robinson as she discusses her latest book The 24-Hour Wine Expert. At a women’s event hosted by the law firm Dorsey & Whitney at Rotisserie Georgette in New York City, Karen Page interviews owner Georgette Farkas about her influences and experiences in running her highly acclaimed Upper East Side restaurant. Karen Page is featured as a Celebrity Sous Chef at SHARE’s Annual “Second Helping of Life” gala at Pier 60 in New York City benefiting breast and ovarian cancer survivors. Karen Page and Andrew Dornenburg attend the official farewell celebrations in honor of NYPD Commissioner Bill Bratton’s last day on the job. Karen Page and Andrew Dornenburg attend the third annual Welcome Conference in New York City. Share. Inspire. Connect. A forum to share ideas, inspire each other, and connect through conversation about hospitality. Karen and Andrew attend the 31st Annual Chefs’ Tribute to Citymeals-on-Wheels at Rockefeller Center in New York City. For tickets, visit http://www.citymeals.org/events-and-news/6-6-2016/chefs-tribute. Karen gets another year wiser in 2016! Karen Page and Andrew Dornenburg attend the 2016 James Beard Foundation Awards at the Lyric Opera House in Chicago. Karen Page and Andrew Dornenburg attend the 2016 Cherry Bombe Jubilee in New York City. Karen Page attends the Spring 2016 meeting of Northwestern University’s Council of 100, which counsels undergraduate women and recent alumnae on their professional pursuits. Karen and Andrew run the New York Road Runner’s Scotland Run 10K in Central Park. Join Karen Page and Andrew Dornenburg — authors of the award-winning books WHAT TO DRINK WITH WHAT YOU EAT and THE FOOD LOVER’S GUIDE TO WINE — for a Twitter Q&A on food and wine pairing on Tuesday, November 24th, at 12:30 pm ET. Karen Page attends Citymeals-on-Wheels’ 29th Annual Power Lunch for Women at The Plaza Hotel in New York City, which annually brings together more than 400 of the city’s most powerful women (the handful of generous men who pay $10,000 for the privilege of joining them) to raise more than $1 million to help feed NYC’s homebound elderly. Karen Page moderates a discussion with seven-time James Beard Award-winning author Madhur Jaffrey at the 92nd Street Y in New York City about Jaffrey’s new book VEGETARIAN INDIA. Karen Page and Andrew Dornenburg plan to attend Hillary Rodham Clinton’s birthday party at the New York Hilton, which will also be attended by President Bill Clinton and where John Legend and Demi Lovato are scheduled to perform. Karen Page and Andrew Dornenburg will be hosted by acclaimed restaurateur Stephen Beckta (Beckta, Play) at Beckta Dining & Wine in Ottawa, Canada, for a book signing and dinner on Friday, October 16th. Contact the restaurant for details. Karen Page attends Northwestern University’s Fall 2015 Council of 100 Conference in Chicago. Karen Page will again be a featured Celebrity Sous Chef at the SHARE’s “Second Helping of Life” benefit featuring some of New York’s best chefs who happen to be women at Pier 60 in Manhattan. Karen Page and Andrew Dornenburg will be interviewed by Shari Bayer on her Heritage Radio Network show “All In The Industry” on Wednesday, September 16th, at 4 pm ET. With any luck, Karen Page and Andrew Dornenburg are due to mark their 25th wedding anniversary on Tuesday, August 25, 2015 — at their favorite place on earth! Having loved the experience of seeing “Hamilton” on March 1st at the Public Theater, Karen Page and Andrew Dornenburg look forward to experiencing this brilliant show on the third night of its Broadway run. Karen Page and Andrew Dornenburg, creators of THE VEGETARIAN FLAVOR BIBLE, will be interviewed by author and host Victoria Moran on “Main Street Vegan,” a weekly program broadcast over Unity Online Radio, www.unity.fm, and podcasted later via iTunes, Stitcher, etc., which seeks to disseminate information about the vegan lifestyle in an accepting and upbeat way. Karen Page and Andrew Dornenburg attend The Welcome Conference, organized by Will Guidara and Anthony Rudolf. The dozen featured speakers include uber-restaurateur Danny Meyer and Eleven Madison Park chef Daniel Humm. Karen Page and Andrew Dornenburg attend Citymeals-on-Wheels’ 30th annual Chefs’ Tribute gala at Rockefeller Center, benefiting New York’s homebound elderly. Karen Page and Andrew Dornenburg attend the Thursday, June 4th benefit for LAVA titled “MOTHERS: a celebration of roots, rocks and matriarchs” at Littlefield, 622 DeGraw Street, in Brooklyn. Karen Page and Andrew Dornenburg attend a wine tasting lunch in New York City hosted by Marchese Lodovico Antinori, showcasing his Tenuta di Biserno wines. Karen Page is interviewed about THE VEGETARIAN FLAVOR BIBLE for Cooking Light magazine. Karen Page and Andrew Dornenburg will join chef Heather Carlucci (formerly of Lassi) for a pop-up vegetarian Indian dinner hosted by chef George McKirdy’s Astor Bake Shop in Astoria. Guests will receive a copy of THE VEGETARIAN FLAVOR BIBLE. Karen Page and Andrew Dornenburg attend the special dinner prepared by Chef Charleen Badman, with Arizona wines paired by Pavle Milic, at The James Beard House in New York City. Culinary nutritionist Stefanie Sacks MS, CNS, CDN, long time Montauk resident, author, educator, speaker and consultant hosts “Stirring the Pot™” Radio on Hamptons NPR, WPPB 88.3, where she will interview Karen Page about THE VEGETARIAN FLAVOR BIBLE. An passionate group of nine bloggers are planning a special online event around THE VEGETARIAN FLAVOR BIBLE from May 15-29, including a Twitter chat on Thursday, May 21st, at 7 pm ET. Karen Page’s interview with Emmy-nominated host of Potluck Video Ali Rosen on THE VEGETARIAN FLAVOR BIBLE airs tonight on NYC Life. @MeatlessMonday hosts a Twitter chat with @KarenAndAndrew about THE VEGETARIAN FLAVOR BIBLE. Karen Page is having a birthday today — and plans to celebrate! The 25th Anniversary James Beard Foundation Awards at the Lyric Opera House in Chicago. Karen Page and Andrew Dornenburg will be hosted for a talk about their work and THE VEGETARIAN FLAVOR BIBLE by the Tredyffrin Public Library at 582 Upper Gulph Road in Strafford, Pennsylvania. Karen Page has been invited to speak about THE VEGETARIAN FLAVOR BIBLE at Ramapo College in Mahwah, New Jersey, in support of the school’s Edible Garden. Karen Page will speak about THE VEGETARIAN FLAVOR BIBLE at the AAUW (American Association of University Women) New Canaan (CT) Branch’s Annual Book and Author Luncheon. The luncheon this year is scheduled for Thursday, April 23rd, at the Woodway Country Club in Darien, Connecticut. Karen Page and Andrew Dornenburg will be celebrating the #dessertworthy movement on Wednesday, April 22nd. Karen Page attends the Spring 2015 meeting of The Council of 100 (100 of NU’s leading professional alumnae) at Northwestern University. Karen will be interviewed about THE VEGETARIAN FLAVOR BIBLE by host Andy Harris of “The SoCal Restaurant Show” on KLAA 830 AM in Los Angeles. 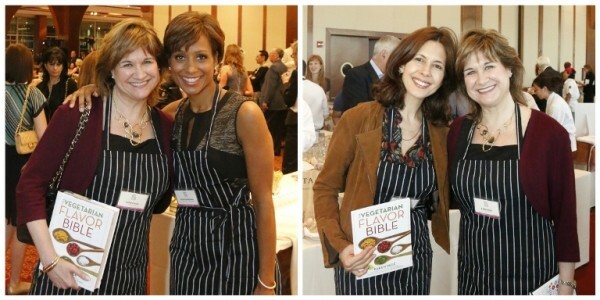 “The Jazzy Vegetarian” Laura Theodore features THE VEGETARIAN FLAVOR BIBLE on Wednesday, April 8th, at 1 pm ET. Two-time James Beard Award winners Andrew Dornenburg and Karen Page will be featured as part of the Lake Austin Spa’s Lake Austin Culinary Experience® on March 9-10th, in Austin. Lake Austin Spa has been featured as one of America’s best destination spas and resorts in media including Conde Nast Traveler, Fodor’s Travel, Travel & Leisure, and U.S. News & World Report. In celebration of National Nutrition Month (March 2015) and National Registered Dietitian Nutritionist Day (March 11, 2015), THE VEGETARIAN FLAVOR BIBLE will be hosted for a Virtual Book Tour of blogs across the United States hosted by Registered Dietitians (RDs and RDNs) — who comprise a particularly enthusiastic segment of the book’s (and THE FLAVOR BIBLE’s) readers. You’ll find the most up-to-date calendar of VBT stops here. Melissa’s Produce is hosting a media lunch (for press and food bloggers) with Karen Page to discuss THE VEGETARIAN FLAVOR BIBLE at its headquarters in Los Angeles. Karen is interviewed by Howard Jacobson, PhD, co-author of the New York Times bestselling book WHOLE with T. Colin Campbell, PhD, about THE VEGETARIAN FLAVOR BIBLE. Karen is interviewed by Greg and Marleen Burch on their KSCO Radio (1080AM) show “Flavors” about THE VEGETARIAN FLAVOR BIBLE. Karen Page makes a guest appearance via Skype to talk about THE VEGETARIAN FLAVOR BIBLE to a group of St. Louis food bloggers. Karen Page is interviewed by David Ransom and Melanie Young of “The Connected Table” about THE VEGETARIAN FLAVOR BIBLE at 2:30 pm ET. Author Karen Page — who had the great pleasure of attending PlantStock 2014 in August on the Esselstyn family farm in New York State — will be hosted for a live chat about THE VEGETARIAN FLAVOR BIBLE on Engine 2 Extra at 9 pm ET. Karen Page is interviewed about THE VEGETARIAN FLAVOR BIBLE on “Food Talk with Kim Bailey” on WWBA 820AM. 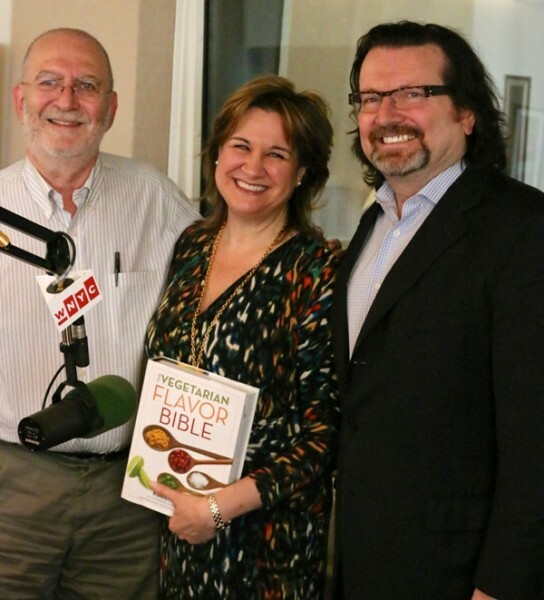 Karen Page and Andrew Dornenburg are interviewed about THE VEGETARIAN FLAVOR BIBLE by host Joel Riddell on his show “Dining Around” in San Francisco. Join two-time James Beard Award-winning authors Karen Page and Andrew Dornenburg at Whole Foods Market (WFM) in Napa, California, on Friday, January 16, 2015, from 5-7 pm as they discuss and sign copies of their latest book THE VEGETARIAN FLAVOR BIBLE. WFM Healthy Eating Specialist Maria Clementi will offer a cooking demonstration using the book. There is no charge, and no advance registration required. The store’s number is 707.224.6300. Join two-time James Beard Award-winning authors Karen Page and Andrew Dornenburg (What to Drink with What You Eat, The Flavor Bible) as they are hosted for a vegetarian wine tasting dinner by Whole Foods Market (WFM) in Coddington, California, in celebration of their new book THE VEGETARIAN FLAVOR BIBLE (with copies available for purchase and signing). The menu features wines from Balleto Vineyards & Winery, Benziger Family Winery, Hook and Ladder Vineyards & Winery, and Mazzocco Winery. Seating is extremely limited. Store number: 707.542.7411. Join two-time James Beard Award-winning authors Karen Page and Andrew Dornenburg at Whole Foods Market (WFM) in Petaluma, California, on Wednesday, January 14, 2015, from 4-6 pm as they discuss and sign copies of their latest book THE VEGETARIAN FLAVOR BIBLE. WFM Healthy Eating Specialist Sharon Bowen will offer a cooking demonstration using the book, and cider and mead will be available for sampling. There is no charge, and no advance registration required. The store’s number is 707.762.9352. On Tuesday, January 13th, at 7 pm, Karen Page is in conversation with Millennium Chef Eric Tucker about THE VEGETARIAN FLAVOR BIBLE at PW’s “Bookstore of the Year” Green Apple Books’ new On the Park location (1231 9th Avenue, San Francisco). Afterward, Karen Page and Andrew Dornenburg will sign copies of THE VEGETARIAN FLAVOR BIBLE and their other books (e.g., THE FLAVOR BIBLE, WHAT TO DRINK WITH WHAT YOU EAT), while Eric Tucker signs THE MILLENNIUM COOKBOOK and THE ARTFUL VEGAN. Karen Page is interviewed about THE VEGETARIAN FLAVOR BIBLE by Kim Bailey on Tampa’s WWBA Radio at 2:10 pm EST. Karen Page discusses THE VEGETARIAN FLAVOR BIBLE with Dr. Mike Roizen, bestselling author of YOU: The Owner’s Manual, on “YOU: The Owner’s Manual Radio,” at 5:30 pm. In honor of “Veganuary,” THE VEGETARIAN FLAVOR BIBLE will be hosted for a Virtual Book Tour of vegan blogs across the United States all month long — and extending into the first week of February, due to popular demand. For the past few years, Karen Page and Andrew Dornenburg have made it a tradition to celebrate New Year’s Eve and ring in the New Year at The Lodge at Woodloch in Hawley, Pennsylvania, which is one of the world’s leading destination spas. Join them for wine tastings and/or evening talks as you relax (and/or get active!) and enjoy this must-visit property. Karen Page is interviewed by award-winning radio host Jennifer English on her “RSVP Radio Show” about THE VEGETARIAN FLAVOR BIBLE. Chef Jamie Gwen interviews Karen Page about THE VEGETARIAN FLAVOR BIBLE on her nationally-syndicated radio show “Food & Wine with Chef Jamie Gwen” at noon (PT) on KABC 790. Karen Page will be interviewed at 7 pm by nutritionist Joy Pierson, co-owner of Candle 79 and the Candle Cafes, at the 92nd Street Y (co-hosted by Kitchen Arts & Letters). Afterward, Page and Pierson will sign copies of THE VEGETARIAN FLAVOR BIBLE and VEGAN HOLIDAY COOKING. Author Karen Page and photographer Andrew Dornenburg will discuss and sign copies of THE VEGETARIAN FLAVOR BIBLE at beloved independent bookseller R.J. Julia (768 Boston Post Road, in Madison) at 7 pm. Author Karen Page and photographer Andrew Dornenburg will discuss and sign copies of THE VEGETARIAN FLAVOR BIBLE at Book Larder at 6:30 pm. Author Karen Page and photographer Andrew Dornenburg will sign copies of THE VEGETARIAN FLAVOR BIBLE at Barbara-Jo’s Books to Cooks from 2-4 pm. Author Karen Page and photographer Andrew Dornenburg will discuss and sign copies of THE VEGETARIAN FLAVOR BIBLE during an event hosted by Barbara-Jo’s Books to Cooks at 6 pm. Authors Karen Page and photographer Andrew Dornenburg will discuss and sign copies of THE VEGETARIAN FLAVOR BIBLE, which features local chefs Aaron Adams and Aaron Woo, at Powell’s at 7:30 pm. Author Karen Page and photographer Andrew Dornenburg will discuss and sign copies of THE VEGETARIAN FLAVOR BIBLE at 12:30 pm at Book Passage at the Ferry Terminal. Author Karen Page and photographer Andrew Dornenburg will discuss and sign copies of THE VEGETARIAN FLAVOR BIBLE at a 6 pm event co-hosted by Kendall-Jackson. Author Karen Page and photographer Andrew Dornenburg will discuss and sign copies of THE VEGETARIAN FLAVOR BIBLE from 3-4 pm at Omnivore Books at 3385A Cesar Chavez St. Author Karen Page and photographer Andrew Dornenburg will discuss and sign copies of THE VEGETARIAN FLAVOR BIBLE at The Spice House (577 S. 3rd St.) in Geneva from 5:30 – 6:30 pm. The Spice House’s delicious next-door neighbor Preservation Bread and Wine will provide tastings inspired by the book. Karen Page writes about one of her favorite flavor pairings for the November 2014 issue of Vegetarian Times, which goes on sale on October 21st. Karen Page will moderate a discussion of THE VEGETARIAN FLAVOR BIBLE and the emerging plant-based gastronomy with featured panelists Terrance Brennan, chef-proprietor of Picholine; Amanda Cohen, chef-proprietor of Dirt Candy; and Bart Potenza, founder and co-owner of Candle 79 and the Candle Cafes at 7 pm at Barnes & Noble on the Upper East Side (86th & Lex). In conjunction with the Food Book Fair, author Karen Page and photographer Andrew Dornenburg will sign copies of THE VEGETARIAN FLAVOR BIBLE at the Union Square Greenmarket from 11 am – 2 pm in their first New York City appearance following the book’s publication. All proceeds benefit GrowNYC, which operates Greenmarkets throughout New York City. Author Karen Page and photographer Andrew Dornenburg will discuss and sign copies of THE VEGETARIAN FLAVOR BIBLE from 6 – 7:30 pm at the Spice House at Milwaukee Public Market, 400 N. Water Street. Karen is interviewed by “The Marilu Henner Show” host Marilu Henner (who received the Physicians Committee for Responsible Medicine’s “Voice of Compassion Award” on PCRM’s 25th anniversary) about THE VEGETARIAN FLAVOR BIBLE. Author Karen Page will be interviewed about THE VEGETARIAN FLAVOR BIBLE by WBEZ’s “Chewing the Fat” host Monica Eng at 7 pm at Barnes & Noble – Old Orchard in Skokie, IL. THE VEGETARIAN FLAVOR BIBLE will mark its official pub. date with a celebration, discussion, and book signing by author Karen Page and photographer Andrew Dornenburg at The Spice House in Chicago’s Old Town (1512 N. Wells) from 6 – 7:30 pm. Karen Page is interviewed by Dr. Mehmet Oz during a segment on “The Dr. Oz Show” scheduled to be re-broadcast today. Check your local listings for times and stations. 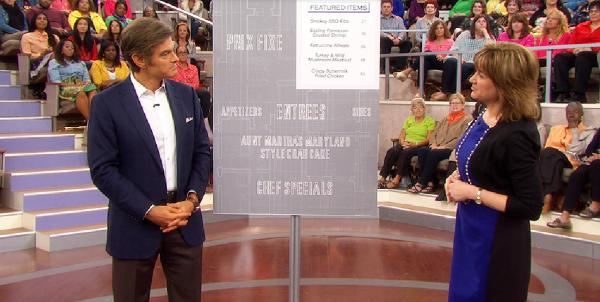 Karen Page is interviewed by Dr. Mehmet Oz during a segment scheduled to air today at 4 pm ET. On the heels of World Vegetarian Day (Oct. 1st), Karen and Andrew join in the celebration of Vegetarian Awareness Month (Oct. 1-31, 2014). Karen and Andrew celebrate World Vegetarian Day (October 1st). For the 11th year in a row, Karen will serve as a “Celebrity Sous Chef” at SHARE’s Annual “Second Helping of Life” tasting event benefiting SHARE featuring dozens of New York’s top women chefs, including 2014’s Executive Chef April Bloomfield, Culinary Chairs Abigail Kirsch and Alison Awerbuch, Executive Chefs Emeritae Rebecca Charles, Alex Guarnaschelli, Anita Lo, and Amy Scherber, and Participating Chefs Einat Admony, Heather Bertinetti, Amanda Cohen, Amanda Cook, Colleen Grapes, Sara Jenkins, Patti Jackson, Elizabeth Karmel, Sarabeth Levine, Angie Mar, Ashley Merriman, Sawako Okochi, Deborah Racicot, Alex Raij, Barbara Sibley, Christina Tosi, Sue Torres, and Jennifer Yee. This year’s “Celebrity Sous Chefs” are slated to include Sade Baderinwa, Brenda Blackmon, Lourdes Castro, Kathleen Chalfant, Melissa Clark, Laura Day, Elizabeth Falkner, Kitty Greenwald, Donna Hanover, Jessica Hecht, Amanda Hesser, Cindy Hsu, Jodi Kantor, Ellie Krieger, Alex McCord, Sarah Moulton, Karen Page, Letty Cottin Pogrebin, Lydia Polgreen, Joanna Pruess, Daphne Rubin-Vega, Valerie Smaldone, Linda Stasi, and Chely Wright. Karen Page and Andrew Dornenburg keynote the 2014 International Food Bloggers Conference held in Seattle on Saturday, September 20th, at 9 am. The James Beard Foundation holds its annual “Chefs & Champagne” event in Sagaponack, New York.